November, 2014 | Run S.M.A.R.T. Vicki Melnick and coach Alvina Begay are on a roll. Fresh off her win at the Toughest 10k in September Vicki took home the HMSA Classical 25k RRCA Masters title. That’s her second masters title this season! What’s Your Actual Marathon Race Pace? In 2013, Runner’s World published a piece by Amby Burfoot that concluded most runners are better off listening to their bodies versus following a formulaic pacing approach, according to a study he cites. The runners held their pace for 13.1 miles, but then slowed dramatically. But wait. We all know The Wall doesn’t hit you until 20 miles. There’s no physiological reasons for marathoners to suddenly fatigue at the halfway point. What gives? Why did the runners crash at 13.1 miles? My guess: The runners were relying too heavily on high goal-setting, heart-rate monitors, GPS systems, equivalent-performance tables, and the like. In other words, they used one or several of these tools to pick a goal pace faster than their actual race-day fitness. That’s what we high-success, high-determination, Type A runners often do. 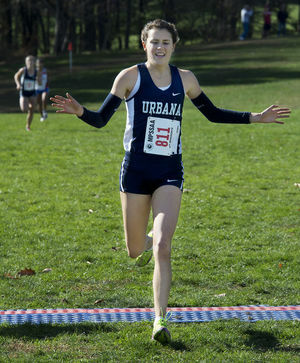 Emily Mulhern took home the Class 3A State title in Maryland this past weekend. Emily is our third high school athlete to win their state class this season. We recently reported Ty Masco’s win in Nebraska here and Annie Hill’s big win in Montana here. Olympic 1500m runner Malindi Elmore has teamed up with legendary coach Dr. Jack Daniels and The Run SMART Project to offer her 1500m/1-Mile training plan to the public. Until this point Malindi has only been available as a private coach through Run SMART. This past spring she helped a private client go from 4:33 down to 4:13 in just one year! Now, in a matter of minutes runners of all levels can customize her 12-week training plan and gain access to her favorite workouts.